OMG! 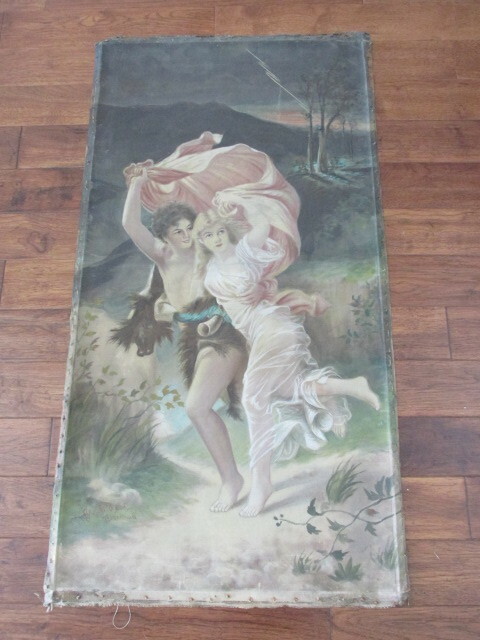 THIS IS AN INCREDIBLE OLD ANTIQUE PAINTING ON A LARGE CANVAS OR TEXTURED FABRIC THAT IS OVER 4 FEET TALL. 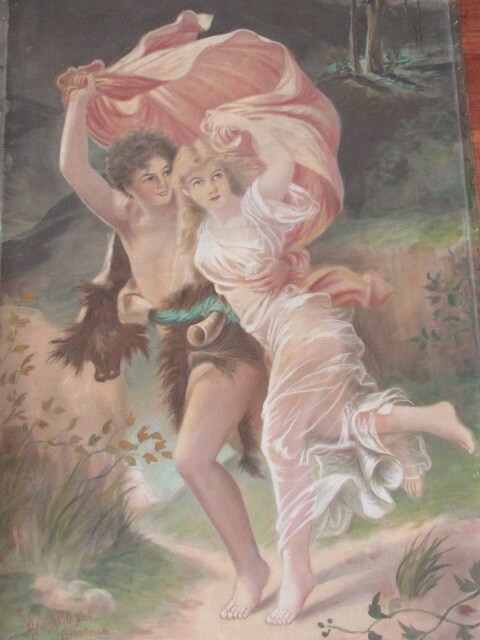 IT IS OF A ROMANTIC MAN AND WOMAN RUNNING THRU THE STORM This is one of those amazing statement making paintings that is older and of very good quality. It is very well painted with the most beautiful colors. 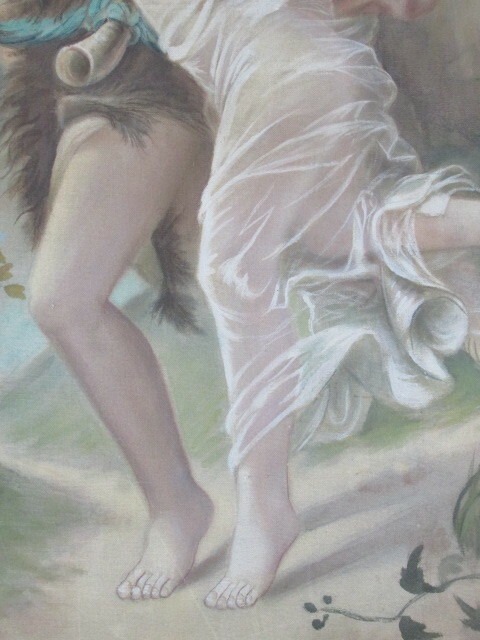 This was painting after a famous French painter called Pierre Auguste Cot from the late 1800's. It is painted on a ridgy or textured canvas cloth that was removed from a frame at one time, and can be rolled for reasonable shipping. You can see the nail holes along the edges, as I show. There is a little fraying along the edges. I have several paintings like this in my home hanging unframed just by nailing to the wall at the top. The man and woman are very beautiful and handsome. 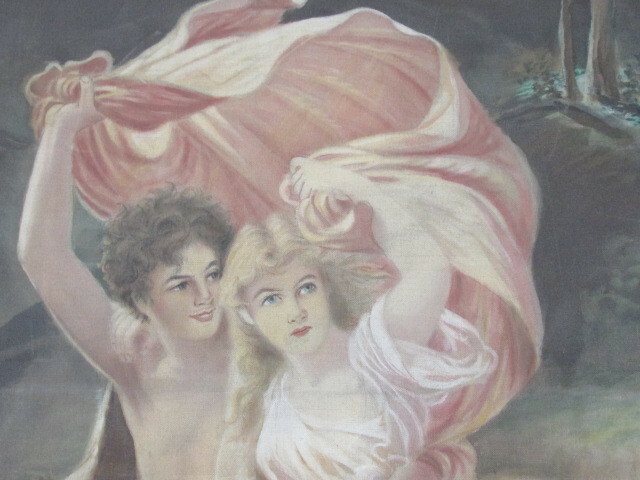 They have their arms around each other and holding a pink cover over them, as they are running away from the storm. This is the best I have ever seen this in and the colors are just gorgeous. This could very easily be a keeper, but I already have several of these large paintings and no more room. There are a few minor stains, some marks, scratches, minor paint loss, fraying and wear. It is signed what looks like Apres P.A. 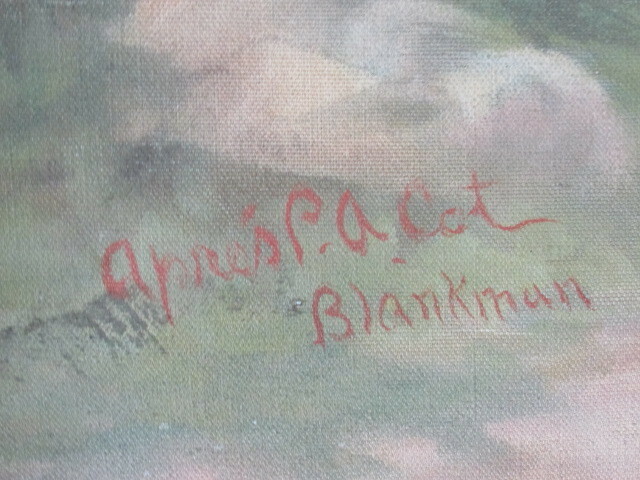 Cot Blankman What a statement this will make in your home! Measurements are about 56" tall by 30" wide.